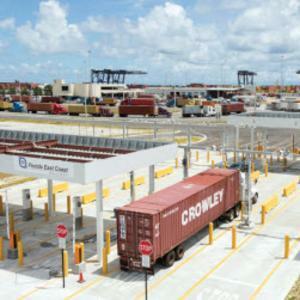 BROWARD COUNTY, FL - Florida East Coast Railway (FECR) is celebrating its first-year anniversary operating its new Intermodal Container Transfer Facility (ICTF) adjacent to Port Everglades with a 26 percent increase in volume, according to James R. Hertwig, FECR President & CEO. "This is a terrific milestone that validates the investment made by FECR, Port Everglades, the State of Florida and Broward County. One that will have long-lasting benefits for the community by reducing road congestion and green house gas emissions," Hertwig said. "We look forward to continued growth at the ICTF as the Port adds new docks and cranes, and expands its harbor with deeper and wider channels." In a model public-private partnership, FECR built the ICTF on 43 acres provided by Broward County&apos;s Port Everglades. The ICTF, which was completed in 18 months and opened in July 2014, is used to transfer international intermodal containers arriving or departing by ship-both north/south and east/west trade lanes - as well as domestic containers and trailers with cargo moving to and from South Florida. Prior to the opening of this facility, such containers were transported by truck to and from Port Everglades to off-port rail terminals in Fort Lauderdale and Hialeah. "The ICTF ensures that Port Everglades is competitive with other U.S. East Coast gateways, and, most importantly, gives South Florida a cost and time-to-market advantage over many of these gateways," said Steve Cernak, Port Everglades Chief Executive & Port Director. Cargo moves through Port Everglades to/from Atlanta and Charlotte in two days, and Nashville and Memphis in three days. FECR&apos;s direct connection to the nation&apos;s Class 1 rail network allows for service to 70 percent of the U.S. population within four days. Additionally, having empty 53-foot domestic containers and trailers adjacent to the Port provides more opportunities to trans-load import cargo from ocean containers to domestic containers for inland rail transport. This results in more domestic containers moving north as loads, instead of empties, increasing the efficiency of the intermodal network. The ICTF is expected to reduce congestion on interstate highways and local roadways because loading and offloading cargo will take place at the Port as opposed to offsite facilities. As a result, air emissions will be reduced by diverting an estimated 180,000 trucks from the roads by 2027. The Florida East Coast Railway ("FECR") is a 351-mile freight rail system located along the east coast of Florida. It is the exclusive rail provider for PortMiami, Port Everglades, and Port of Palm Beach. FECR connects to the national railway system in Jacksonville, Florida, to move cargo originating or terminating there. Based in Jacksonville, Florida, FECR provides end-to-end intermodal and carload solutions to customers who demand cost-effective and premium quality. For more information, visit fecrwy.com. At the crossroads of north-south and east-west trade, Broward County&apos;s Port Everglades is Florida&apos;s leading international container port, handling more than one million TEUs (20-foot equivalent units, the industry standard measurement for container volumes) and serving as a gateway to Latin America, the Caribbean, Europe and Asia. Located within the cities of Fort Lauderdale, Hollywood, and Dania Beach, Florida, Port Everglades is in the heart of one of the world&apos;s largest consumer regions, including a constant flow of visitors and up to a combined 110 million residents and seasonal visitors within a 500-mile radius. Ongoing capital improvements and expansion will ensure that Port Everglades can continue to handle future growth in container traffic. A world-class cargo handling facility, Port Everglades serves as an ideal point of entry and departure for products shipped around the world.